Unlike the Method of Paired comparisons and Equal Appearing Interval Methods, the scale values of the statements are not obtained on the basis of Psychological Continuum in Summated Rating Method, while it is assumed, that every statement indicates about attitude in a same manner, and the people have to give their scaled response on the statements. Therefore, Likert introduced Method of Summated Ratings in 1932 and it is also known as Likert’s Method of preparing Scale Attitude and the scale is called Likert’s Scale. For every statement to scale attitude in Likert’s Method five responses, strongly agree, agree, undecided, disagree, strongly disagree, are presented. A person has to reflect his quantity of attitude about the statement by choosing any one of the five responses. 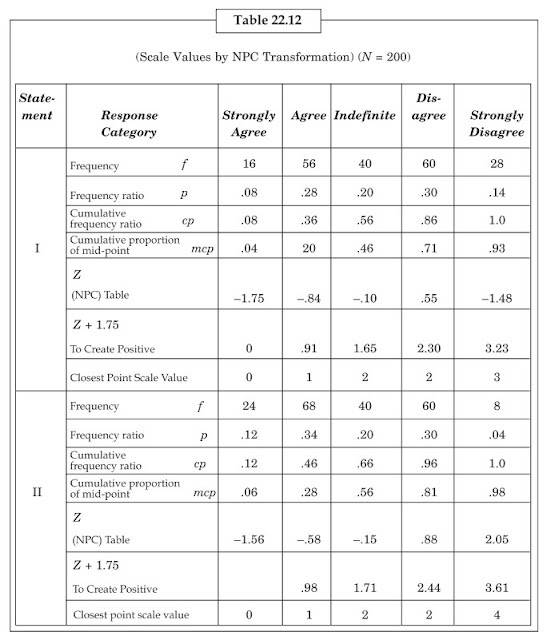 In the beginning, Likert evaluated the Z value of (Frequencies), the number of person who selected all the five responses categories for a statement, by Normal Curve Transformation Method, and these Z values were accepted as a scale value for all the different response categories. The process of knowing Z value will be clarified in Table 22.12. Likert came to know that different scale Values will be received for all the five response categories of different statements. This process was very difficult, and to know Total Attitude Score of a person with the help of these scale values was a very difficult task. But later Likert found that by giving the scale values of 4, 3, 2, 1 and 0 to all the five responses categories above mentioned, there was a full positive relation (more than .99) between the attitude scores obtained in this way and attitude scores obtained by the scale values obtained by the normal curve transformation. 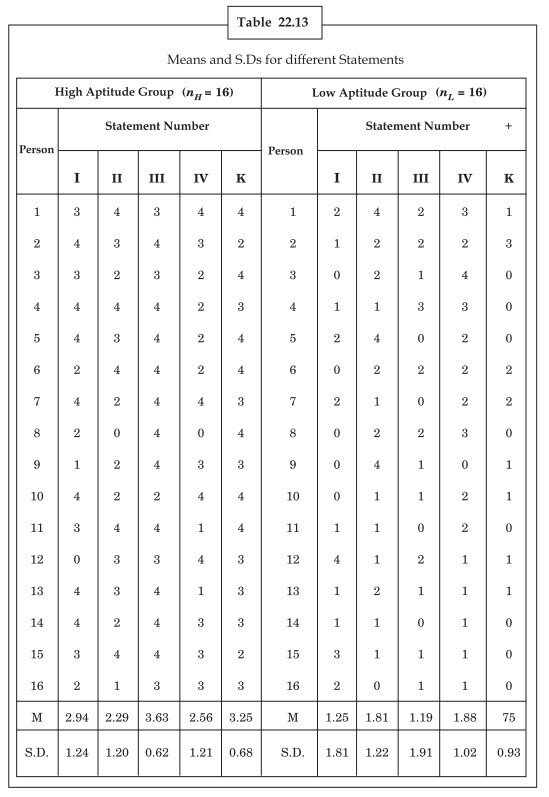 It is clear from the pre-described table that for the first, the scale values for different responses categories are 0, 1, 2, 2, and 3, and for the second statement, scale value are gradually 0, 1, 2, 3 and 4, which is near to category 0, 1, 2, 3 and 4. This is the reason why that Sigma Scoring Method was relinquished as a difﬁ cult method, and the simple method of 0, 1, 2, 3 and 4 came into existence. Now strongly agreed, agreed, undecided, disagreed and strongly disagreed responses are given the numbers 0, 1, 2, 3 and 4, respectively. The Total Attitude Score of a person, on the attitude scale prepared by Likert, is the total of the marks received on all the statements, because a person has to determine his responses on different statements, and the attitude score is expressed on the basis of total rating. Therefore Bird called this method of preparing attitude scale as Method of Summative Rating. This method of preparing attitude scale developed by Likert is more known as Method of Summative Rating in present. To prepare attitude scale by the Method of Summative Rating a big number of attitude statements are prepared first. Along with the pre-available statements on attitude scales, we can take a help from the articles published in newspapers, magazines, suggestions of experts and personal meetings. Important—To know mid-point cumulative ratio (p), the half of the series frequency ratio is added in the cumulative frequency ratio (cp) of the series below it. Some statements are prepared negative and some positive. After the preparation of statements they are carefully published and the difficulties and vagueness of the language are removed. Pre-tryout method can also be used. From very well composed statements, some appropriate statements are selected. The method of selecting statement is different in Likert method from Thurston. According to Thurston Method, the statements were divided in different categories on the psychological continuum, and inappropriate statements were selected on the basis of scale value and fourth deviation. While in Summative Rating Method, by using the Post Analysis Technique, the discriminating power of statements is known, and on the basis of decimating power, the statements were selected. The statements having less discriminating power were rejected and the statements with more decimating power were accepted, considering them as appropriate statements for the survey. It is clear that scale values of the statements are pre-determined in Summative Rating Method, therefore, there is no question of obtaining their values. To know the discrimination power of the statements normally T test is used, and the statements having significant T values are considered as discriminating statements and which statements with significant T values are rejected. To select the statements prepared on the basis of discrimination power, first those statements are applied on a big sample of the people for whom the Attitude Scale is being prepared, and a total attitude score is obtained for the sample of every person. 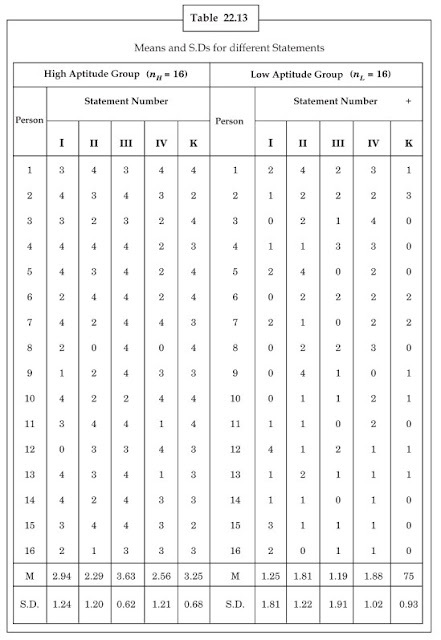 In the process of obtaining the score values, the responses are numbered as 0, 1, 2, 3, and 4 Positiveness and Negativeness is also considered while giving marks. When a statement is positive, 4 marks are given for a strongly agreed response, and for agreed response, 3 marks are given, for indefinite 2, for disagree 1, and for strongly disagree 0 is given. When the statement is negative, this order of giving marks/numbers is reversed, means for strongly agreed 0 is given, for agreed 1 is given, for indefinite 2 is given, for disagreed 3 is given and for strongly disagreed 4 is given. Here one more thing should also be understood that some scale manufactures also use numbers like 1, 2, 3, 4, 5 for grading different responses on statements in to Likert’s Method. Actually both the processes 0, 1, 2, 3, 4, and 1, 2, 3, 4, 5 give the same information, only the place of mode or middle point is different, because Likert used 0, 1, 2, 3, 4 process therefore we have used this method in this book. For the last few years, some experts have also started using less than 5 or more than 5 responses categories for preparing attitude Scale in Likert method. For example, three point scale (0, 1, and 2) and seven point scale (0, 1, 2, 3, 4, 5, and 6) are also very popular methods. It is clear the number 1 and number 3 indicate the neutral and median stage on psychological continuum. After calculating the responses given on different statements by the person and by adding them, attitude score mark is received, which is mentioned on the response sheet of that person. After receiving the total attitude marks from response sheet of the different people of a sample, they are ordered in an increasing order. In this sequence the response sheets having more than 27% marks are placed in high attitude group while less than 27% are placed in low attitude group. It can be assumed that these two groups are criterion groups for the evaluation of attitude statements, and the people getting more marks/numbers like 4 or 3 for a good statement should be placed in high attitude group, while the persons getting less marks/numbers like (0 or 1) should be placed in low attitude group. In other words any good statement should be discriminating. According to this assumption, t number of tests is done to evaluate the statements. 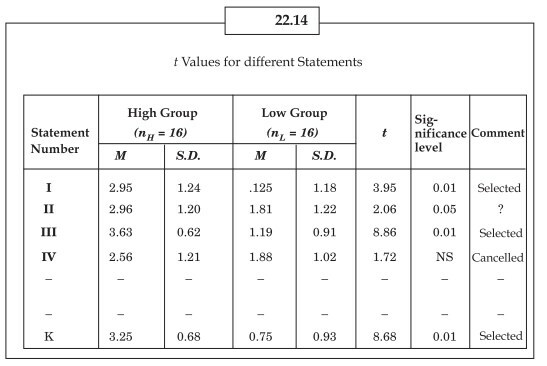 A calculation of median value and deviation value for high and low attitude groups is presented in Table 22.13, while in Table 22.14 T value is obtained after comparing high and low groups for different statements. A decision can be made to include the statements in the final form of scale on the basis of significance of T values. The T values, received from above mentioned method show that how much a statement is successful in discriminating high and low group. If t is significant then the statement can be considered as discriminatory statement. For the significance of T, the significance level of .05 or .01 can be selected. One tailed test is being used here, so if the value of n is high, then value of t can be considered significant on the level of 0.5, if it is higher than 1.65 and on the level of 0.1 levels if it is more than 2.33. If the value of n is less, then to see the significance of t, the table of t values has to references. In Table 22.16, for different (dfs) on the levels of .05 and .01, t values are presented. In the comparison between two different groups the values of df in t test is ( nH + nL − 2). Normally the statements having significant difference on .01 levels are selected in scale, and insignificant statements are rejected. Statements on the significance level of .05 are considered less significant, and are included in scale only in the case of dire need. 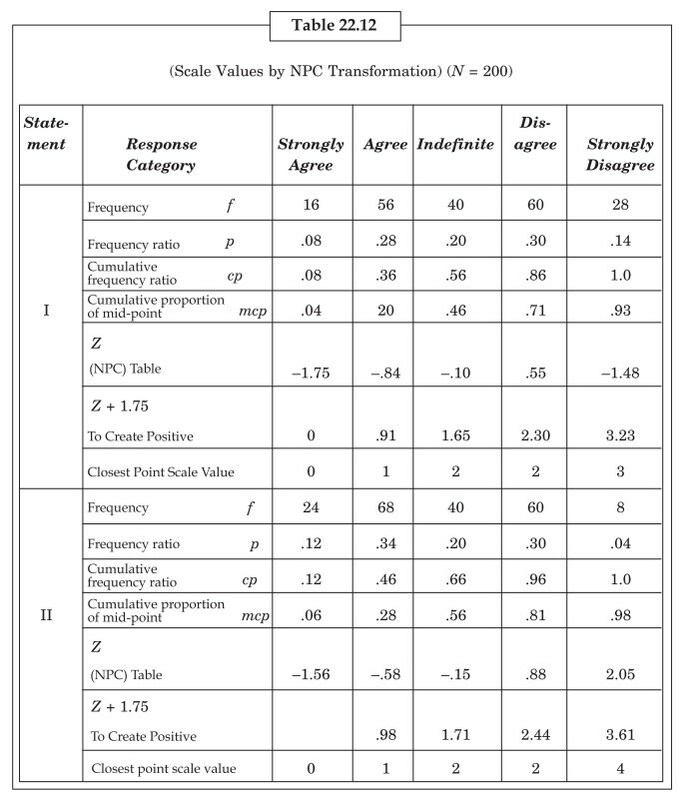 In this way on the basis of received T values of different statements, the discrimination power is known, and the statements having significant discrimination power can be included in attitude scale, while statements having insignificant discriminating power were assumed inappropriate, thus rejected. 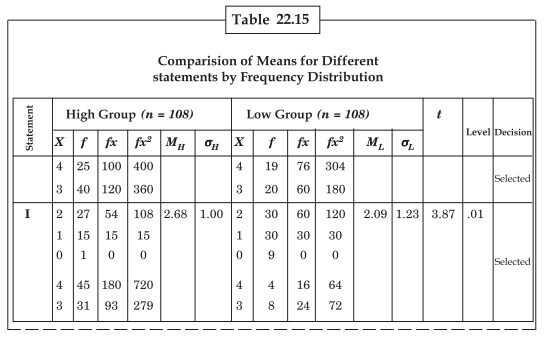 While preparing attitude scale through summative rating method, normally 30 to 40 such statements are selected, which are capable to discriminate in high and low groups. Therefore statements having more T value are selected to be included in the scale. For this, statements having significant T value are arranged according to their T values, and 30 to 40 statements with high T value are separated. (The quantity of selecting statements depends upon the scale manufacturer’s choice). It should also be kept in mind while selecting the statements that some should be positive and some negative. Normally, approximately half positive and half negative statements are selected. By separating both types of statements, the possibility of response set of the people while giving their responses on attitude scale get minimum. If only positive or negative statements are included in Scale, then there is a possibility of response tendency. To know the discriminatory values of statement, any other method of post analysis method can also be applied. At last by finalizing the statements in a random order, the final form of attitude scale is ready, and it can be applied on the people, whom attitude is to be scaled. The people have to give their response on statements of Scale, like strongly agreed, agreed, indefinite, disagreed and strongly disagree, by selecting any one of the five categories. The responses, on given statements by people, are given marks with the help of marking method like 4, 3, 2, 1 and 0, (if the statements are negative then 0, 1, 2, 3, and 4.) The total of all the marks received on statements, will indicate the total attitude of a person. After preparing the final draft of the scale, the reliability and legality is known through testing-retesting or semi-separation method. The legality of subject matter and concurrent legality can also be known. To explain the marks received on the scale they can be converted into standardized marks. For this, T-scores percentiles can be used. Scale manufacture can prepare a conversion table to convert the received marks into scored Marks on the scale. Prepare and compose at least 50 or more attitude statements. Present and apply the scale on a big sample of those people, for whom attitude scale is being prepared, in which every person have to express his response like strongly agreed, agreed, indefinite, disagree, strongly disagree by selecting any one, from five responses. Give marks through marking 4, 3, 2, 1, and 0 (if the statement is positive) or 0, 1, 2, 3, and 4 (if the statement is negative) and know the attitude score, on the given responses by people. Arrange the response sheets in a sequence on the basis of total score and separate them in high group or low group according to 27% discrimination method. Calculate the medians and deviation value of marks secured from people of high groups on different statements. 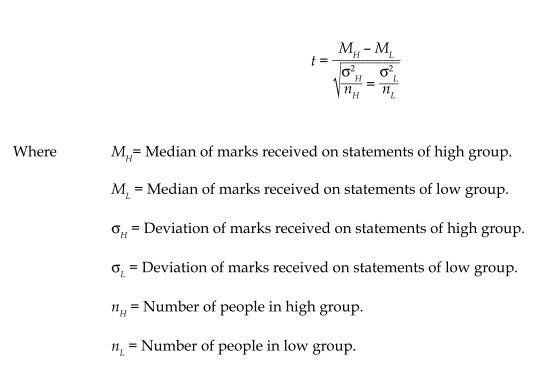 Calculate the medians and deviation value of marks secured from people of low group on different statements. Calculate value of T- ratio, for comparing the medians of high and low groups for every statement. Arrange significant T value statements, in a sequence on the basis of T values and select 30-40 statement with more T value. Prepare a final form of attitude scale by arranging the selected statements in a random order. Apply the attitude scale on people and to know their total attitude score by evaluating statements through above described method. Apply attitude scale of people and know the reliability and legal coefficient. Prepare a conversion table to convert attitude scores in T scores or percentiles.